In this Tuesday, Sept. 26, 2017 photo, coal trucks and heavy equipment look like children's toys on the Middle Ridge surface coal mine, which cut off part of Coal River Mountain in Raleigh County, in southern West Virginia. 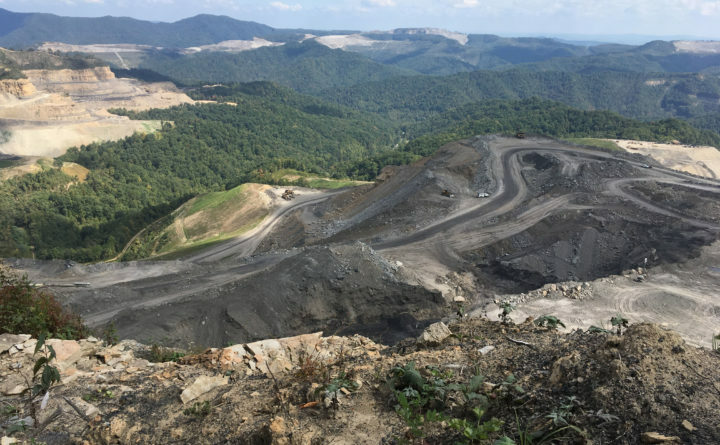 Other mountaintop removal mines are visible on the horizon. Tech companies like Amazon and Etsy are fighting the Trump administration's push to preserve coal power. Just ask Etsy Inc., the go-to marketplace for crafts that doubled its electricity use in two years to feed power-sucking data centers that keep the $2.8 billion-a-year business running. It’s one of the many technology giants including Amazon.com and Alphabet’s Google demanding cheaper – and cleaner – electricity as their data demands grow. This hunger for power has set Silicon Valley on a collision course with the Trump administration, which is working up a plan to keep coal plants afloat by raising electricity prices. As a rare source of demand growth, these tech firms have become formidable advocates for clean energy. They’ve contracted enough renewable energy to displace at least 12 coal generators, and some are paying millions to sever ties with utilities to find their own supply. Big Tech is no longer “afraid to throw around their weight or their ability to influence – some might say bully – their local utility or local governments in what they want to get,” said Lucas Beran, a senior research analyst on IHS Markit’s data center and cloud team. It’s easy to see why the companies have become such advocates. Power used by all the nation’s data centers is set to climb 4 percent from 2014 to 2020, according to an Energy Department report. Server farms now draw enough electricity to light up Las Vegas and the rest of Nevada, twice over. Etsy alone used 10,679 megawatt-hours last year – enough to supply 1,000 homes. While coal still accounts for about a third of U.S. electricity, it’s losing ground to cheaper natural gas, wind and solar. Hundreds of mines have shut in recent years, and President Donald Trump campaigned on a pledge to revive them. His administration is now calling on the Federal Energy Regulatory Commission to enact a plan that would subsidize coal-fired power plants. Their push for clean power extends well beyond Washington. Alphabet has called on utilities to create “buy-as-you-go” renewable energy programs. The demands of modern electricity consumers have outgrown the standard utility business model designed “for a bygone era,” it said in a white paper last year. The Mountain View, California-based company, which runs the world’s largest online search engine, has signed contracts to buy 2.6 gigawatts of renewable energy that it said will lead to $3.5 billion of investments. The fight to transform power supplies is just the latest instance of technology companies flexing their political muscle and green image. Earlier this year, the industry opposed Trump’s decision to remove the U.S. from the international Paris climate accord. Many including Google, Microsoft and Facebook pledged to continue the battle against global warming. Utilities aren’t opposed to investing in renewable power. But technology companies are demanding supplies in quantities that could disrupt the reliability of transmission systems, said Matt Mooren, an energy analyst with PA Consulting Group. Switch Inc., a Las Vegas data-center provider agreed to pay $27 million last year to leave its Nevada utility in a bet that the company could find cheaper renewable energy elsewhere. Microsoft paid almost $24 million to bypass a Washington utility and find power on its own. In September, a group of tech firms including Adobe Systems pressed Dominion Energy for more renewables in Virginia – a hot spot for data centers – noting that the companies represent the utility’s biggest source of future demand growth. Less than a month later, Dominion agreed to add clean power for a new Facebook data center, paving a potential path for others. Tech companies have a lot of leverage now over state governments and utilities that are “drooling” over the power use from data centers as demand from other industries flat-line, said Gary Cook, a senior analyst at Greenpeace who specializes in information technology. And they’re not waiting on government to effect change. In West Virginia – the heart of America’s Coal Country – potter Joy Bridy makes everything from mugs to sauerkraut crocks that she sells on Etsy. Her operation is powered by solar panels that Etsy helped her get.